We are a dedicated team of cider evangelists, experts of our craft! THE CIDER I LIKE TO DRINK IS: SOUR. FUNKY. DISTINCTIVE. A devoted a cider fan, lover of artistic beverages, and a true health nut. As a native of Toronto, Mark was raised in the apple country of Southwest Ontario, Canada. Destined to become a cider evangelist, Mark began his career in the craft beverage industry at the age of 19. Soon after completing his business degree at Canada's top beverage management school, Mark established his place in the industry by opening one of the first craft beer bars in Canada back in 2003. After helping to pioneer the craft beer industry in Canada, Mark began to give up the suds in favor of cider! Known as a pioneer of the craft cider culture in Southern California, Mark has worked tirelessly to educate consumers and grow awareness for the industry of craft cider both here and beyond our great state. THE CIDER I LIKE TO DRINK: DRY. CRISP. WOODY. Every team needs a quarterback, within our cider huddle we look to Ciera to call the plays on a daily basis. She is a workhorse when it comes to operations, and will stop at nothing to achieve our objectives. When you order cider from us, it is Ciera who whips the horse that pulls our cider car in your direction. Of course she doesn't actually whip any horses, Ciera's calm command gets them moving just fine. There are few who are as passionate about cider, and Ciera grew up in the beverage industry as her parents are bar operators here in Los Angeles. She is on a never ending mission to please our customers, whilst spreading the cider message across the land. THE CIDER I LIKE TO DRINK: DRY. FRUITY. COMPLEX. Chief Order Taker. Fort Holder Downer. Costume Assembler Extraordinaire. You can call her what you like, just don't call her late for dinner! Stacy wears several hats in our head office, all of them perfectly coordinated and suited to each day. She could use a few more hands, but she gets by just fine with two. At the center of our cider filled universe is the infamous "order desk", this is where most of our customers have the pleasure of meeting Stacy. THE CIDER I LIKE TO DRINK: DRY. EARTHY. TANNIC. Shannon is a product of the famed Hudson River Valley in New York, one of of America's greatest cider producing regions. Growing up in an apple driven culture certainly helped to plant the seeds in her mind, she moved across the country and is now a cider expert who is working to grow the industry in sunny California. THE CIDER I LIKE TO DRINK: BALANCED. COMPLEX. TANNIC. One of the original "Healthy Spirits" in San Francisco proper, Brad is our passionate cider expert covering the North Bay and the northern half of downtown SF. He follows the 101 corridor as it passes through the land of the Golden Gate, providing premium craft ciders to the many purveyors in this world renowned beverage mecca. Brad grew up in the Bay Area, he has a deep connection with the land and the wonderful folks who tend to it. He is a brewer, a cider maker, and another bearded defender of the craft! His passion is fierce, and his palate precise. Well connected in the region, you can count on Brad to navigate you through the labyrinth that is the Bay Area cider scene.....arguably the #1 cider region in America! 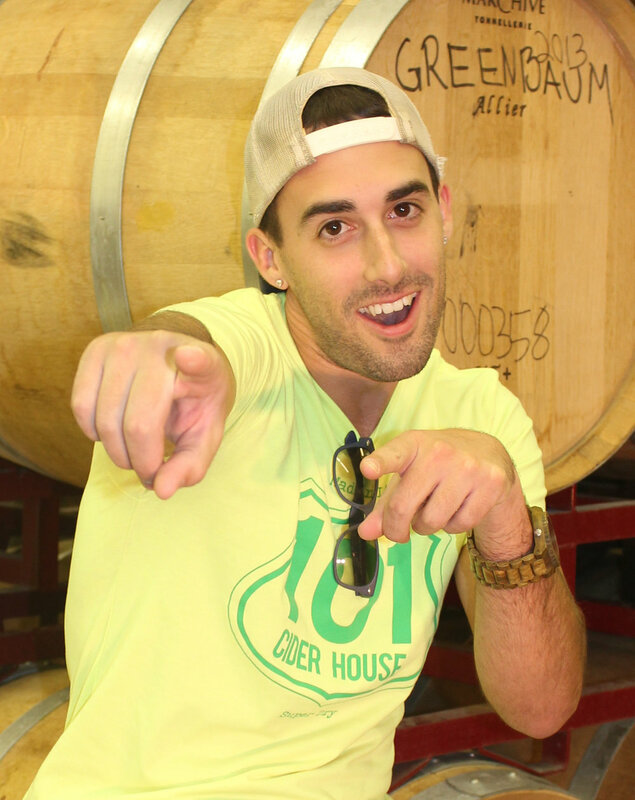 One of the few great ones, a California native, Ethan is our cider expert covering the vast stretches of the Central Coast from Malibu to San Luis Obispo and beyond. This is the heart of California cider country, and Ethan has seen it all. We depend on his relentless efforts to spread the word for craft cider up and down the 101 corridor, the unofficial cider route of the western US. Ethan is a talented home brewer and craft beer enthusiast, and a young cider expert who is always happy to coach others as they explore the growing craft cider category. Look out for him as he cruises the 101 from one great cider destination to the next, if you are on the cider path you will likely find this smiling defender of the craft!